Ok so, again, I'm soooo not a Pink girl but I love that this is Pink, Girlie and yet Clean and Fun! One of my BFFs issss a Pink girl, guess who is getting this card?? Lol. (Yesterday was National Girlfriends Day after all...). This amazing, new stamp set Lacy & Lovely is perfectly set to pair up with various punches. I love how they list the coordinating punches at the same place!! (pg 99 in the Idea Book & Catalog) The sentiments and the images are so lovely (& lacy!!). 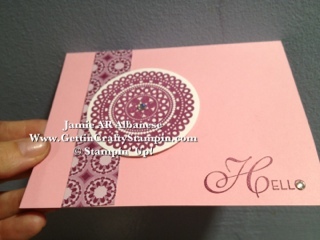 The 2 1/2" Punch is awesome in making this pretty image easily used for the card. (see the IBC pg 164 for our stunning 12x12" DSP!). 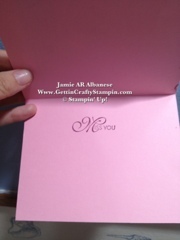 I used our Stampin' Dimensional to add a lil dimension (lol). Here I used Rich Razzelberry ink on Whisper White paper. The International Bazzaar is an amazing Designer Series Paper and fits this image so well!! Lil 1/2" strips add a great lil dash of flair. By adding the splash of bling with our Adhesive Backed Rhinestones to the "o" of a word, a perfect lil treat! I added another to the Center of the stamped image, too. I hope this card brightens your day and for a non-pink girl, this Pretty in Pink paper really made me feel great! !